It’s crunch time... though, to be fair, it’s felt like crunch time for the last four episodes or so. With such a high caliber of chefs in this competition, there really isn’t any room for error any more - any little thing can send you home. Though now, with only four chefs remaining, and three tickets to the Top Chef finale in Guadalajara, it really is crunch time. It’s about to get real. The cheftestants enter the Top Chef Kitchen and find Padma standing next to multiple-time James Beard Award=winning chef Michael Solomonov. Borrowing a challenge from Top Chef Masters, the chefs will put their communication skills to the test by working with an unknown person to each make identical looking and identical tasting dishes. The catch? The cheftestant and the mystery person will be separated by a partition, meaning that the chef will be able to tell the person what to do, but won’t be able to see what they’re actually doing. In total Top Chef fashion, the mystery persons are not mysteries at all, but loved ones. We have Brooke’s sister and the spouses of Sheldon, Shirley, and John. Padma starts the challenge and the chefs, who each have the same ingredients and tools, immediately start trying to figure out what they can make that will be delicious enough to win but simple enough for a non-chef to make without any actual assistance and minimal guidance. As the clock ticks away, the chefs slice, sear, and plate their dishes, all the while yelling across the partition certain instructions and tips to their respective partners - with Shirley’s voice (unsurprisingly) carrying the furthest. It seems almost unbelievable, but three of the four chefs have no idea who they’re working with. Only Sheldon discerns that the person on the other side of the partition is his wife. Everyone else is oblivious. Chalk it up to nerves and adrenaline, I guess? In the end, all four dishes are successes and each pair of dishes is quite similar in appearance and taste. John and his wife have a pan-seared scallop with jumbo lump crab that are both prepared well. Shirley and her husband produce scrambled eggs with brown butter and a crab ragout that are well-seasoned, though a bit better by Shirley’s husband. Brooke and her sister have collard greens, a bacon hash, and a poached egg that, again, taste great. And Sheldon and his wife serve a six-minute egg with sautéed mushrooms and charred onions that features a subtle citrus element. Sheldon ends up winning the challenge, a sous vide machine, and $10,000, which Sheldon vows to take to Vegas. Pivoting from tangible rewards to intangible awards, the winner of the Elimination Challenge will get the opportunity of a lifetime - the chance to cook at the James Beard House in New York City. Three of our remaining chefs have been nominated for James Beard Awards (the Oscars of the cooking world, we’re told): Sheldon, Shirley, and John. For the chef that makes the winning dish - a dish that must represent the chef’s journey during his or her time in Charleston - they’ll get the ultimate opportunity to develop a whole menu for service at the James Beard House. But how about a little fun before then? Padma tells the chefs that they’ll have 30 minutes to shop at Whole Foods for their challenge, and after some time to prep, she’ll cook dinner for them and their loved ones at the Top Chef house that night. Such a gal, that Padma is. The chefs blow into Whole Foods with differing levels of confidence. Sheldon and Shirley know exactly which route they’re going, each incorporating ingredients and techniques they learned while in the city with dishes and flavors from their own heritage. Brooke, on the other hand, is struggling with the abstract nature of the challenge. She chooses, then, to go literal, and picks out ingredients that were featured in challenges that she won this season. Interesting approaches, eh? Flavors and techniques from the city vs. ingredients that got you wins? During the prep session following the shopping trip, though, the only person having real trouble with his dish is Sheldon. He’s trying to do some wacky spin on chow fun - a typical Chinese noodle dish - by grinding down Carolina gold rice (a staple ingredient of the region) and turning it into noodles. Only the noodle-thing ain’t happening. There’s not enough starch in the rice for it to stay together in noodle form. As Sheldon leaves the Top Chef Kitchen, and throughout dinner with Padma, the chefs, and their spouses/sister, he can’t stop obsessing about the fact that his noodles aren’t coming together. Once back in the kitchen the next day, Sheldon enacts his solution - he adds more rice flour and tapioca flour to the noodle batter and sticks it in the steamer. If the noodles don’t come together, he won’t have a dish. He’s got some time, though, thankfully. John is up first with a sofrito-crusted scallop with a braised leek broth, which he fears may be too simple to win him a ticket to the finale. The judges all adore the broth, which really brings out flavors reminiscent of the sea, but Tom can’t get past the fact that John didn’t peel the bell peppers he used to make his sofrito, which left a bitterness in the dish. Other elements in the dish (like the broth) also had a hint of bitterness. Though she really, REALLY wants the opportunity to cook at the James Beard House, Shirley declares that she isn’t cooking for the judges anymore, and that she’s no longer intimidated about cooking for a table full of James Beard Award winning chefs. This dish is about her and it’s dedicated to her grandparents. She puts forth an oil-poached grouper with a meat and bone “herb tea” consommé. As usual, the judges adore Shirley’s consommé, with one diner comparing it to a hug. Gail says that the dish perfect captures Shirley’s finesse at combining cuisines, with a broth that’s meaty and southern, but with clear Chinese aromas. Tom tells her that the dish should be a signature one for her. Things are not going so well with Brooke, who always knows when a dish isn’t coming together. She has a braised pork shoulder and pork tenderloin with radishes and an egg yolk - all elements from challenges she won. The judges pepper her with questions - how did you cook your pork, why did you add the egg yolk, what went into the sauce, etc. It’s clear that while the dish doesn’t necessarily taste bad, the judges have a couple of hang-ups about it. Sheldon is last, which gave him enough time to perfect his noodles. He offers the judges chow fun noodles (which don’t look ANYTHING like chow fun noodles) made from Carolina gold rice with pork belly, okra, and an annatto seed and turkey neck broth. It’s a huge hit. Tom ate the okra, an ingredient he detests, and Guest Judge Sean Brock says he’s going to steal the noodle idea. It’s no surprise that Shirley and Sheldon are on top of the challenge and are on their way to the finale. Tom declares Shirley’s dish to have been “just perfect,” and Gail loved the way Sheldon used different vegetables to bring out the flavor of the noodles. Tom goes even further, predicting that Sheldon will, at some point, take a place among the greatest of the American chefs. I cannot remember higher praise coming from Tom for any chef on the history of the show. And with that said, Sheldon ends up winning the last Elimination Challenge before the finale - his first for the season. He’s been close many times, but he won the most important one and goes into the finale with tons of momentum. As does Shirley. But who will join them? Tom compliments John’s broth but really wishes he’d peeled his bell peppers to avoid incorporating bitter notes—this is just a pet peeve of Tom’s. As for Brooke, she made a big mistake sous-viding the pork tenderloin, which stripped the meat of all its juices. Her sauce was also too sweet, having used Coca-Cola as part of her braising liquid. In Bravo fashion, Padma asks John and Brooke what it means to be standing where they are - so close to the finale but not yet assured of a spot. Brooke breaks down, tearfully telling the judges that she didn’t want to come back to Top Chef and not do better, and confessing how frustrating that she might not be able to make it as far as she did last time. In an attempt to diffuse the situation, Padma sends all the chefs back to the stew room without giving John an opportunity to answer the question. But when the chefs are brought back before the judges, the expected happens. Having made just a few more missteps than John in her cooking techniques and ingredients, Brooke is going home. 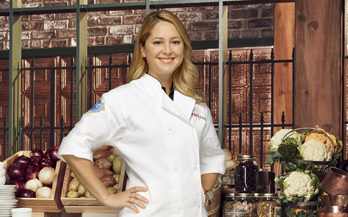 Brooke stoically shakes hands with the judges and hugs the other chefs goodbye. Though Tom had declared just moments ago that there were no losers in this challenge, just someone not moving on, it’s clear that Brooke views herself as the loser. She was close last time, and she’s no closer this time around - at least, not yet. There’s still Last Chance Kitchen, and how ironic would it be if Brooke were to follow Kristin’s trailblazing path and win after making it back through Last Chance Kitchen. The door isn’t closed just yet. We’ll have to see if Brooke can fight her way back and rejoin the competition in Guadalajara.